Many organizations across industries are leveraging single-purpose Chrome OS devices for their customers and their employees. These devices are used both as kiosks to access a single application and as digital signage to easily share and display content without the hassles of relying on IT resources. According to Forrester’s research, 66% of customers want to self-serve for routine tasks and information and want this experience to be easy with minimal friction. 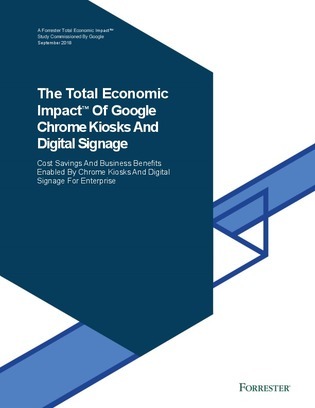 Download this resource to learn how Chrome kiosks and digital signage add significant value to organizations by providing personalized assistance to customers that can be easily replicated and deployed at any location. In addition, find out how Chrome kiosks augment operations, boosting employee productivity and experience.